A Yoni Steam or Vaginal Steam is a blend of herbs to be used when administering a vaginal steam treatment. This blend opens the energy and heals tissue. Ingredients Rose, Oregano or Monarda, Basil, Calendula, and Yarrow. Indulge in your very own vaginal steam box, handmade with love and intention. We can stain it or leave it natural. Size can vary depending on your height and weight. Will ship in one piece. Standard size is 15x15x15, larger sizes are available. Optional items include: handles, various wood species combinations, hinged door, back rest, removable lid, Butchers block oil, or Beeswax coating. Please contact us to vary specify optional items. Email me at stregagardens@gmail.com to set up a phone consultation. This moontime oil is made for massaging your belly before, after, and during your menstrual cycle. Apply to the entire buttocks and pelvis, lower back and thighs. It is made from the infused oils of St. Joan's Wort for nerve pain, Hops for muscle pain, Calendula keeping the cells healthy, Cottonwood Bud oil for pain, Turmeric oil as an anti inflammatory, Olive oil. There are no essential oils just the flowers and aerial parts of each plant. This oil is to best kept in the refrigerator, or a dark cool place. Will keep for up to 6 months. It's a formula that holds a sense of protection and clearing while bringing in the blessings of your ancestors. The ingredients are Rosemary, Ponderosa Pine resin, Calamus Root, and Rose. Powdered together with intention and love. 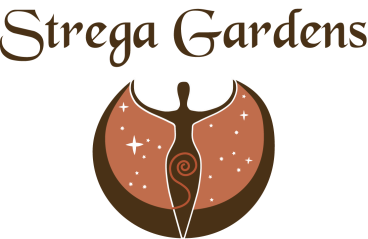 Strega's Clean Kitchen Smudge Kit includes 2oz of the Smudge blend, bamboo charcoal burners, and a booklet with songs and prayers to use while smudging. It's a formula that holds a sense of protection and clearing while bringing in the blessings of your ancestors. The ingredients are Rosemary, Ponderosa Pine resin, Calamus Root, and Rose. Powdered together with intention and love. Sweetgrass harvested in the Summer of 2018 in the Rocky Mountains, Colorado, braided with love and intention. My daughter and I braided these together as they are meant to be done. Burn these in your space to draw in the sweet spirits to bless your life. This is the medicine of women, for nurturing and nourishment. 2 in each package. A cleaner burning alternative for all your incense and resins. Ponderosa Pine pitch harvest in the Colorado Rocky Mountains and cured for 5 years. Beautiful dark amber color. Limited stock.